Monte Sant' Angelo Mercy College is a Catholic secondary day school for girls. Located in the heart of North Sydney, the school is located close to Sydney Harbour and is easily accessible by a vast public transport network. Students are perfectly situated to take advantage of the facilities a city-central school has to offer, including parks, libraries, social hubs, academic resources and co-curricular activities. As a leading independent girls’ school, we are renowned for our innovative approach to education, extensive curriculum choice and our diverse co-curricular program. We encourage the pursuit of academic excellence through a rigorous educational program that allows our students to achieve at the highest level. In Years 11 and 12 we offer a dual-based curriculum, the Higher School Certificate and International Baccalaureate (IB) Diploma Programme. We are committed to ensuring that every student is supported, nurtured and valued. Our pastoral care and Co-curricular programs ensure our girls have a balanced, holistic education that promotes self-growth. 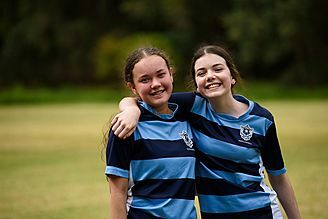 Our Middle School aims to recognise, understand and meet the pastoral, academic and spiritual needs of students in the period of early adolescence, as they make the crucial transition from primary school and complete their first three years of a Mercy education. Our approach utilises carefully developed systems and processes with a focus on building strong connections and respectful relationships, while nurturing resilience and resourcefulness and fostering a love of learning. There is no ‘Middle School’ building or area at the College, nor are students in Years 7, 8 and 9 separated from the Senior School by a different timetable or taught by different teachers. Rather, the younger students are able to access all of the College’s facilities, benefit from specialist teacher expertise and mix on a regular and productive basis with both their peers and senior girls. 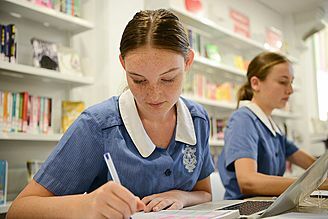 All students in Years 7 to 9 undertake a course of study that meets requirements for both the NSW Educational Standards Authority and the International Baccalaureate (IB) Middle Years Programme. The College enjoys an outstanding reputation in the IB world for its integrity and consistently outstanding academic results. This was reinforced by the students who successfully completed the IB Diploma in 2018, two of whom achieved a perfect score of 45 (UAC of 99.95). This Year undertakes the NSW Board of Studies curriculum, and concurrently undertakes the International Baccalaureate Middle Years Programme (IB MYP). In the Senior School we offer a cohesive, but differentiated learning environment in which every student regardless of academic ability has the opportunity and encouragement to achieve her potential. The College offers the IB DP as an option for students entering Year 11. The IB DP offers an educational challenge that provides scope for both academic achievement and worthwhile practical activities in outdoor pursuits and social service. It is a cross-cultural programme that allows students to gain an increasing knowledge of, and respect for, the cultures of the world.